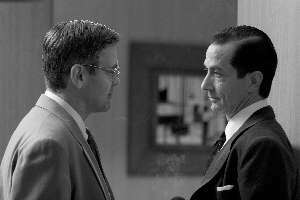 Cast: David Strathairn, George Clooney, Robert Downey Jr, Patricia Clarkson, Jeff Daniels, Frank Langella. Directed by George Clooney, shot in black and white. Story: True-to-life CBS TV journalist Ed Murrow takes on the might of Senator McCarthy. Good Night, and Good Luck is another of the many true stories doing the rounds at the moment, and it's one of the better ones. In the 1950s, Ed Murrow was a news anchor for CBS in a time of communist paranoia typefied by draconian commie-catcher Senator Joe McCarthy. 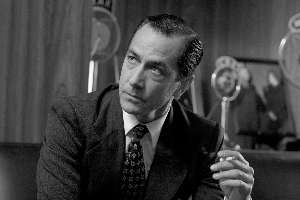 Eternal supporting actor David Strathairn slicks his hair down and steps up to the plate as leading man Murrow and looks like he's been there all his life, becoming a suave and debonair newsman of the era like a penguin takes to a glacier. George Clooney supports as Murrow's right hand man and also directs, his first movie in the chair since 2002's Confessions of a Dangerous Mind. He's clearly got a talent for this kind of movie, injecting as he does 10cc of drama into an innately dull subject. Robert Downey Jr's role does not plop without a ripple into the river of the plot - it feels tacked on - but he still delivers a vibrant performance, showing he's still a top class performer. In fact Clooney teases marvellous performances from all his employees, with particular credit going to Ray Wise, a busy actor who's struggled in the past to breach the radar of most viewers, languishing in the mire of TV series for most of his career. It's the atmosphere that makes Good Night, and Good Luck so good - the newsrooms are chatty and chaotic, the black and white film assists the chronology and the archive footage grounds the movie in reality. Done carelessly, the grainy shots of real-life senator Joe McCarthy could have been clumsy and disruptive, but they are all shown on TV screens, with the characters watching, so it actually adds to the authenticity. The hour and a half zips past, which is quite an impressive feat considering the political and sedate content and the lack of variation throughout. It's gripping stuff, made all the more so by the fact that it really happened - the genuine McCarthy footage is hard to take your eyes off. It's up for six Oscars - Best Picture, Best Director, Best Cinematography, Best Original Screenplay, Best Art Direction and David Strathairn is up for Best Leading Actor. For my money, if it wins Best Art Direction, justice has been done. In this reporter's opinion, Good Night, and Good Luck is a cracking movie and well worth checking out if you like a good realistic atmosphere without the whizzbangs and pyrotechnics. To enjoy this film you should be: in no need of a testosterone fix. Good Night, and Good Luck is released in the UK on 17th February.